Inside My Radio by Seaven Studio is a mix of rhythm-action and platforming, a mix that we’ve not seen on PSN since Sound Shapes and, like that game, it combines cool, stark visuals and a fresh soundtrack with some fairly basic gameplay ideas. You play as Taek, a green LED (along with other characters later on). Taek exists inside a dying radio and it’s up to you to bring the radio back to life with music. 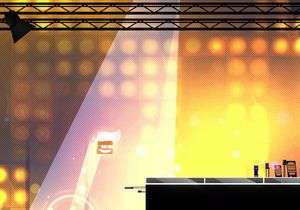 While musical ideas are heavily featured, this is more of a platform game but with the twist that your main actions (jumping, slamming down through obstacles and dashing forward) must occur on the beat of the music. This doesn’t necessarily add more of a challenge to the game but rather just very temporary moments of frustration. The game itself is short and easily beatable within a couple of hours. To its credit it does throw in a few curve balls in the form of set pieces and boss battles, in an effort to mix things up, but for most of the time you’ll just be negotiating some incredibly easy platforming sections. There are puzzles but often these come down to just hitting the circle button at a fairly obvious location on the screen. The only difficulty comes from a short boss rush at the end of the game and even that doesn’t put up too much resistance. However, once the game is beaten, you can replay sections of it in Time Attack mode and this is incredibly taxing. The only question is, will you be bothered enough to play it after you’ve seen everything else the game has to offer? Probably not. Those of you who do stick with it will have to get accustomed to some rough time limits and a need to hit everything on the beat but the motivation for this is going to be lacking. As with too many games of this type, you almost get the impression the levels were more fun to make than they are to play. Sound Shapes was certainly like that but had the foresight to add a fairly solid editor to let you tap into that. Instead, the levels here really are just too basic and repetitive and there isn’t much you can do to affect that. The game is fairly fun to play but it ends up being saved by the bell a little. Anything longer than a couple of hours of this and you’d get bored. There are some nice things to see and hear along the way, though. The use of music is clever with various genres vying against the core electro soundtrack; touches of reggae, dub and even metal all add to the charm. However, we’d have liked to have seen a bit more interaction with the music. While you have to work in concert with the soundtrack, you don’t really get to affect it much apart from one tantalising moment where you play around with a mixing desk. Moments like those, as rare as they are, are what you’ll take away from the game, ultimately, and when mixed with the game’s quirky, minimalist graphics and fun cast of characters, Inside My Radio isn’t lacking in charm. It is, however, lacking in substance. Big time. Platforming superstars may want to cross swords on the game’s Time Attack leaderboards but everyone else will have moved on from this title after a day. There is a foundation here for a bigger and better sequel that doesn’t treat players like platforming rookies but, for now, it’s hard to see Inside My Radio as a successful piece of interactive art instead of something of a gaming failure. 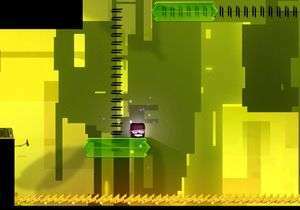 With its basic platforming and tacked on rhythm-action element, the gameplay here doesn't shine. The creativity, soundtrack and general presentation are of a much higher standard but you can't help feeling the developers had more fun making this than you're having playing it. As likeable as Inside My Radio is, you won't be drawn back to it after the short story is finished.